【COMPLETE UNIVERSAL FIT FOR EVERY ARM & PHONE】- Introducing our all new armband designed to fit EVERY SIZE OF ARM. Using powerful strap to wrap around your arm comfortably, you can be assured the armband stays snugly in place during vigorous activities. To keep your phone in place, we use a new type of strong stretchy rubber that is specially designed to stretch and fit your phone screen no matter it's size. These bands can be stretched to hold PLUS SIZED & REGULAR SIZED phones firmly in place. 【 5 STARS FOR ACCESSIBILITY 】- Finally, you have complete access to all your phone's functionality while it is in your armband. No more having to open a zipper to access your phone, or fighting with the unresponsive clear plastic casing that goes over your screen like many other armbands have. 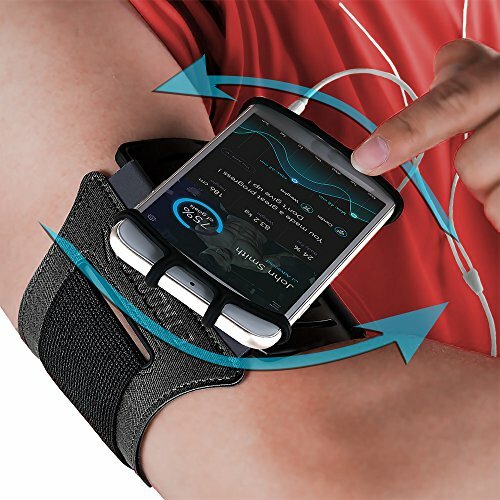 This FULLY OPEN CONCEPT armband will make your runs and workouts so much more enjoyable by being able to easily use your phone's finger scanner, change songs, text, face time and plug in headphones. 【 180° ROTATION for OPTIMAL VIEWING 】- Easily rotate your phone 180 degrees for better viewing. This is the feature you didn't know you needed until you've experienced how much time it will save you. NO MORE having to pull your phone out of an armband to get the right viewing angle to read a text. Just simply use our easy turn swivel and view the text on the fly. Now you can watch videos, type messages, Face-time & read eBooks all while your phone is being comfortably held up by our armband. 【 BRING COMFORT TO YOUR EXERCISING 】- **As seen on FOX, CBS, NBC and ABC. ** Featuring the all new LIGHTWEIGHT and BREATHABLE flexible arm strap that hugs your arm and assures the Armband will stay in place during your run or work out. Our all new design has vents to keep air flow between your arm and phone. Our SOFT but durable fabric will allow you customize your Armband to fit your arm PERFECTLY! In just a few seconds you will have this Armband Holster adjusted to fit your arm comfortably! 【 USE THIS ARMBAND FOR EVERYTHING 】 - If you enjoy WORKING OUT, HIKING, CYCLING, JOGGING, WEIGHT LIFTING GYM TRAINING, OR ANY OTHER SPORTS, then this Armband is perfect for you. Unisex design makes it great for all women, men, teens, boys and girls to use this armband. This stunning Armband is much different from others you will see on Amazon by offering exceptional ★★★★★ quality and comfort all at the same time of giving you the best looking Armband in the gym.